As we continue downtown, you may consider a short stop at Caswell and Massey at 48th and Lexington, the country’s oldest pharmacy. There are several restaurants in the area suitable for a lunch break or snack. The pharmacy still offers the cologne or after-shave GW purchased from them back in the 1770’s. Twelve blocks south at Madison and 36th make a brief stop at the Pierpont Morgan Library to see the Presidents death mask. Right before you is actually how George Washington really looked; the mask is identical to a mold done while he was alive. You will find it difficult to leave the very elegant private library of J.P. Morgan after the overwhelming scale of the Metropolitan Museum, so you may choose to end your tour here. We continue downtown to Washington Square and pause a moment before the two formidable white marble sculptures of Washington that stand on either side of the graceful Triumphal Arch at the entrance to the Park on Fifth Avenue and Waverly Place. Built in 1889 to commemorate the 100th anniversary of his Inauguration, on the left, see GW as General and Military Commander, while on the right – the citizen President. We will conclude our tour downtown in the Financial District. You can just as easily decide to begin your tour here as a cluster of nearby sites has Washington connections and then work your way north. See GW's handsome bronze statue outside Federal Hall (the plaques underneath with scenes from his life photograph nicely). Look for the President’s chair in St. Paul’s Chapel on Broadway and Fulton St. Once upon a time, he and Martha worshipped here. Finally, we arrive at Fraunces Tavern Museum, where you can enjoy a traditional American lunch or dinner. The beautiful brick building maintained by the Son’s of the American Revolution is the place where Washington bid his officers farewell in 1783. 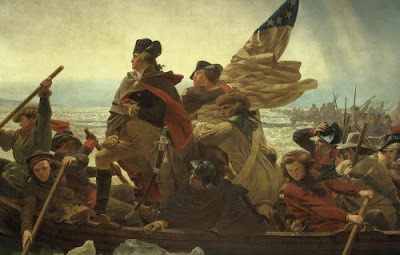 If you would like to explore more about the American Revolution and Colonial Period, http://www.socialstudiesforkids.com/ is the place to go. The site provides lots of pictures and downloadable information such as every President's Inaugural Address, take a moment to read GW's First Address here. A special re-enactment of Washington’s Inauguration will take place on April 30. Mark your calendar to join the colorful celebration in honor of the 220th Anniversary of this historic event at Federal Hall and St. Paul’s Chapel, call 212 233-4164 for details. Remember, George Washington's actual birthday is February 22. Caswell and Massey 518 Lexington Avenue at 48th Street, New York, NY 10017, http://www.caswellmassey.com/ , 212-755-2254. Directions: MTA from 42nd Street Times Square, 7 or S to Grand Central and 6 to 51st Street walk south to 48th. The Pierpont Morgan Library and Museum, 225 Madison Avenue @ 36th Street, New York, NY 10016, www.themorgan.org, 212-685-0008. Directions: MTA from 42nd Street Times Square, 7 or S to Grand Central, walk one block west to Madison Ave, south to 36th St.
Washington Square Monument Fifth Avenue at Washington Square, New York, NY 10012. Directions: From Times Square MTA 1 to Christopher Street, walk east pass Avenue of the Americas to Washington Square. A, C or E to West 4th Street, walk east to Washington Square, N, R or W to 8th Street, walk west to University Place, turn left to Washington Square. Federal Hall, 26 Wall Street, New York, NY 10004, www.nps.gov/feha/, 212-825-6888. Directions: From Times Square MTA 2, 3 to Wall St., R, W to Rector walk east to Wall St.
St. Paul’s Chapel, 209 Broadway, New York, NY 10007, www.saintpaulschapel.org, 212-602-0874. Directions: From Times MTA 2, 3, A, or C to Fulton St, walk west to Broadway. Frances Tavern Museum and Restaurant, 54 Pearl Street corner of Broad St., New York, NY 10004, http://www.frauncestavern.com/, 212-986-1776. Directions: From Time Square 1 to South Ferry, R, W to Whitehall walk north and east to Broad Street. Each year as we approach President’s Day, my thoughts always turn to George Washington more often than Abraham Lincoln because of his many associations with our great city. New York was the nation's first Capital and the site of many Revolutionary War skirmishes and episodes. The founding fathers fort fierce battles, held secret meetings, planned and plotted military occupations right from here. Our first President took his oath of office on Wall Street where his bronze statue now stands in front of Federal Hall. Many school kids and students are on Winter Break this week; one way to keep them entertained while they learn, is to plan a visit to one or more of the sites along what I call "The George Washington Trail." It is sure to vividly bring to life many action charged events like the dramatic scene in the painting above and ignite an interest in the men and women who laid the foundation of our nation. Given the limited attention span of youngsters these days, this tour will be impossible to accomplish in one day, so select two or three sites for an outing and bring along coloring books and construction paper. One good rule, no more than forty-five minutes at each location. We'll begin far uptown under his namesake the George Washington Bridge inside the tiny Little Red Lighthouse (see Postcard Jan 29, 2008, click here). Close your eyes a moment and try to imagine how this area looked in 1776, long before the bridge, when it was rural fields and farmland. Look across the Hudson; think what it was like to sail up the river in the cold winter months. Imagine what happened to ships when the River froze. Travel 15 blocks downtown to the next site, the Morris Jumel Mansion at 160th St, the former country home of British Colonel Roger Morris; this was occupied by Washington in 1776. Walk upstairs to the airy comfortable bedrooms and see where GW slept. Just a few blocks south on 141st St. you'll find The Grange, home of Alexander Hamilton, the first Secretary of the Treasury in George Washinton's cabinet. After the Revolution, the nation was seriously in debt. Hamilton worked tirelessly to establish a solid financial base and currency for our young country. His office was downtown on Wall St. This was his country retreat, it usually took hours to travel here by horseback; do you think he may have invited Washington to come for a visit? The Metropolitan Museum of Art at 83rd and Fifth, is our next stop. Find the enormous painting above, "Washington Crossing the Delaware" on view in the American Wing. Wow! The grand sweeping heroic scene makes you almost feel the wind. I know your thoughts, what a difference between a photograph and the real thing? Tear yourself away to look for the famous portrait of GW by Gilbert Stuart. Before you leave, don’t neglect to peek at the rustic Pilgrim Century and Colonial Period furniture rooms. Notice, it looks as if the inhabitants only just departed. The Metropolitan Museum, usually closed on Mondays is open Presidents Day, with a host of events (films, talks, hunts) designed for families with young children to experience together. The Little Red Lighthouse, Fort Washington Park, 178th Street and the Henry Hudson Parkway, New York, NY 10033, dial 311 and ask for the Urban Park Ranger. Directions: From Times Square MTA A to 175th Street walk west toward the river, check specific directions in January 29, 2008 Postcard here for details. The Morris-Jumel Mansion, Roger Morris Park, 65 Jumel Terrace at 160th St, New York, NY 10032, 212-923-8008. http://www.morrisjumel.org/. Directions: From Times Square MTA C train to 163rd Street, proceed up St. Nicholas to Roger Morris Park you will see the Mansion. The Grange – Will reopen in the near future, check www.nps.gov/hagr for details. The Metropolitan Museum, 1000 Fifth Avenue, New York, NY, 10028, 212-535-7710, http://www.metmuseum.org/ Directions: From Times Square MTA S or 7 to Grand Central Station, 4, 5, or 6 to 86th Street, walk west toward Central Park to Fifth Avenue, short walk to 82nd Street.